Sunday morning of September 14th. at about 10:10 A.M.
flames view from Presidio Hill. A. C. Heidrick home and studio is the White house with firemen trying to save it. It was lost to the fire. At 4 P.M. the oil boiled over from tank # 6 spreading the fire to adjoining tanks and home and studio of A.C. Heidrick. The Fire burned for a number of days, with burning oil flowing into Monterey bay for a time it was thought that Fishermen's Wharf would be lost. Two soldiers from the Presidio of Monterey were killed fighting the oil fire Pvt. George Bolio of the Headquarters Co. 11th. Cavalry and Eustace Watkins, E Battery, 76th Field Artillery. 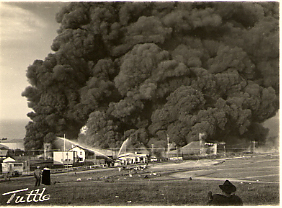 1924 was known as the year of fires with the Hotel Del Monte on the 27th. of September 1924. Holdings: over 80 images of the fire, Over 150 relating to the Coalinga Oil and Transportation Company and the Monterey Oil industry. And photos by a number of other Peninsula Photographers. 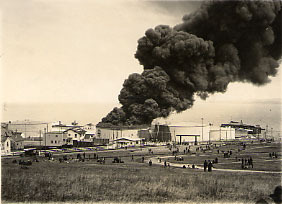 Other fire and firemen and also Ships and boats and California Industry from our photo collection. Monterey 19Th Century Historic photo collection. Monterey 20Th Century Historic photo collection.